AUGUSTA, Ga. — The 2019 Masters was still in question when Martin Kaymer plopped down in the men’s locker room. The 34-year-old German had just signed for a Sunday 71, and a two-over total for the event. As his brother Philip got comfy next to him, Kaymer cracked a Diet Coke and pulled out his iPhone. He yanked off his cleats and propped up his feet. It was time to watch history. In the middle of the television screen hung in the locker room at Augusta National, Tiger Woods stood on the 17th tee box, holding his driver and a two-shot lead at Augusta National. A flurry of other pros had come through the locker room Sunday afternoon. It was grab and go with sliders, shrimp and salad on the menu. For many of the pros here — including Patrick Cantlay, Rafa Cabrera-Bello, Corey Conners and Eddie Pepperell — another PGA Tour event begins in just a few days. Each man checked the broadcast for a few moments, but the Kaymer brothers were glued to it for the long haul. So was the wait staff. Woods smashed his drive up the 17th hole, confirming its accuracy with a club twirl. “Oh, there he goes now,” Martin Kaymer said excitedly. That driver led Woods around Augusta National better than it has in a very long time. “I’m gonna head out to 18 to see it,” one over-eager locker room attendant said. “You’re gonna do that and some green jacket is gonna see you on TV,” a cook said in retort. Yes, sometimes the signature moment of a Masters can send even a rigidly-ruled Augusta National into frenzy. 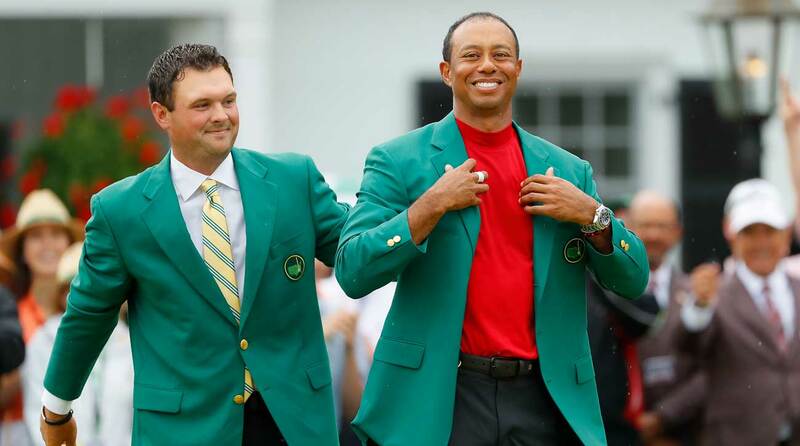 Patrick Reed helps fit Tiger Woods with a fifth green jacket. 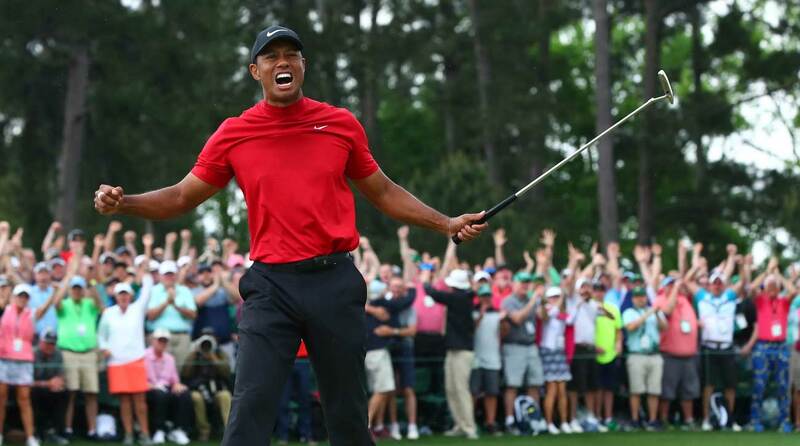 Woods nearly aced the 16th hole, and with that birdie he grabbed the 2019 Masters by the throat. Two tricky par 4s remained. Up ahead on 18, Dustin Johnson missed a birdie putt. Brooks Koepka missed a birdie on 17. Did they see that old, familiar name atop the leaderboard? Alex Noren momentarily paused his locker clean-up to watch Woods’s approach at 17 spin back to nine feet. He had to shove off to Harbour Town. Woods made his par, and then Rickie Fowler joined the watch party. “Where’s T at?” he asked. Woods had pulled off the pitch shot exactly as his Jupiter, Fla., pal drew it up. He was safely aboard the 18th green, where he won for the first time 22 years ago. He won his second green jacket in 2001, which was also his fourth straight major. His third Masters title came a year later in defense. He beat Chris DiMarco with a 15-foot birdie on the first playoff hole in 2005. That was 14 years ago. Tiger Woods reacts immediately after clinching the Masters. The whole room pondered for a quiet second or two. Fowler knocked on the wooden wall for good luck. Suddenly they realized the broadcast was on a 10-second delay. About 200 yards away, the crowd roared louder than ever. Woods had made the putt, and the Masters was over. Fowler didn’t wait to see it on TV. He was already out the door to congratulate his friend. Kaymer stayed put. Like Woods, this two-time major-winner has endured highs and lows — but none as severe as Tiger’s. No public scandal, no train of debilitating injuries, no DUI arrest. But it’s fair to say Kaymer isn’t nearly the same golfer now that he was at his peak, either. His world rank of 194th in late March was the lowest it has been since September 2006. Woods was No. 1 back then by a ridiculous margin. As his brother leapt to watch Woods walk by the locker room window, Martin stayed focused on the television, chin resting on his right hand. Not far away, Woods signed his card to close the book on major no. 15.